Combining two different immunotherapy treatments could dramatically improve lymphoma survival, according to a University of Southampton study. Funded by Cancer Research UK and published in Cancer Cell the study tested different combinations of antibodies* in the lab to see how they interact with each other and what effect this has on how the immune system fights cancer. When combined, the researchers found the antibodies recruit greater numbers of immune cells called myeloid cells, as well as increasing their ability to destroy cancer cells. This is the latest example of ground-breaking cancer immunology research from the University of Southampton. 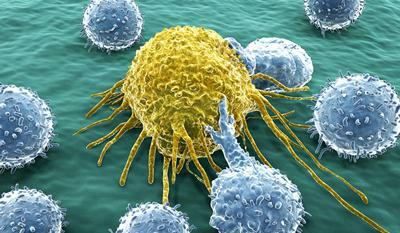 Early next year the University will open the UK’s first centre dedicated to cancer immunology research. The Centre for Cancer Immunology will bring together world-leading specialists in a unique state-of-the art centre, accelerate research progress, conduct more clinical trials and save more lives from cancer. Dr Sean Lim, a Cancer Research UK clinician scientist at the University of Southampton who led the study, said: “By combining two specific antibodies – anti-CD27 and anti-CD20 – we’ve increased the ability of the immune system to destroy cancer cells. Professor Karen Vousden, Cancer Research UK’s chief scientist, said: “This study greatly increases our understanding of how different immunotherapies can work together to improve the way we treat lymphoma. *Researchers tested a variety of combinations of ‘tumour targeting’ monoclonal antibodies and ‘immunomodulatory’ monoclonal antibodies. They showed that anti-CD27, an immunomodulatory monoclonal antibody, enhanced anti-CD20 (tumour targeting) therapy in various preclinical models. **Median survival for mice given anti-CD20 therapy ranged between 24 and 49 days. Median survival for mice given anti-CD27 therapy ranged between 49 and 79 days. When given the drug in combination, almost all mice survived until they were euthanized at 100 days. ***Based on these data, a phase 2, multicentre clinical trial will test the combination of rituximab and varililumab in patients with relapsed and/or refractory B-cell non-Hodgkin’s lymphoma.